This collection consists of a October 1995 edition of the newsletter, Historic Rock Hill News and Views, produced by Historic Rock Hill. 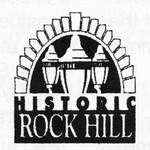 Historic Rock HIll is a nonprofit organization begun in the late 1980s as the Mid-Town Preservation Association. Historic Rock Hill’s purpose is “to preserve and protect the historic resources of Rock Hill (SC) and enhance the livability of historic areas." The Historic Rock Hill News and Views Newsletter was deposit in the Archives on November 3, 1998 by Deborah Jennings. Louise Pettus Archives and Special Collections, Winthrop University, "Historic Rock Hill Newsletter - Accession 891 - M406 (457)". Finding Aid 623.